The trailer is in excellent condition and has been stored inside a garage since purchase. It comes with 7-pin vehicle electrics but with an adaptor for 13-pin vehicle electrics. A padlock for the trailer handle is also included in the sale. 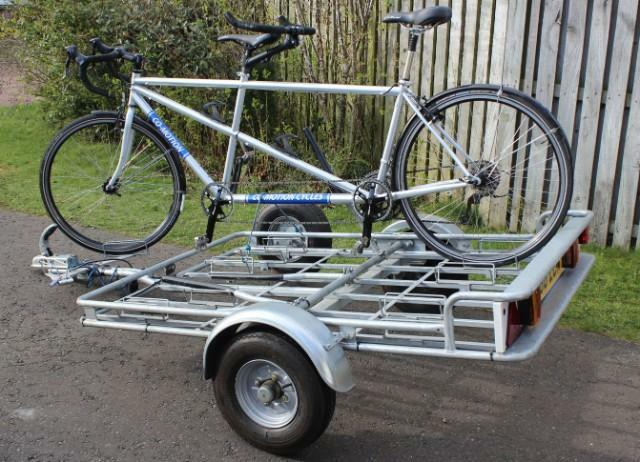 The Trailer is designed for carrying 6 solo bikes, but comes with the tandem carrier accessory, which allows for 2 tandems to be carried, alongside up to 4 solos. The optional extra spare wheel is also included. This trailer, with the accompanying accessories would cost approximately £850 direct from Pendle. 2004 Co-motion Tandem in picture has now been sold. Thanks for your interest in the tandem. Additional photographs are on the Tandem Club Facebook page. Please email for further information.